Tomatoes do not like laying on the ground. When they lie on the ground, the fruit can spoil, you can get more bugs, and even the leaves may rot faster. That is why most of us will put a cage on the plants in order to keep them propped up. But, what if you don’t have the room for a cage? Well, there is the “new fangled” way of trellising tomatoes UP. Trellising tomatoes up is a simple way of tying the tomatoes to a support above the plant, not surrounding it. 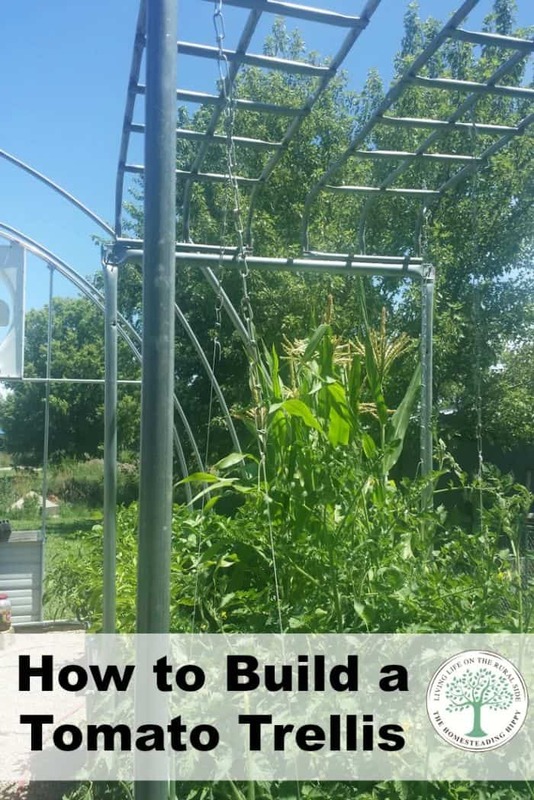 This is great for those who use raised beds for their gardening, and have little to no room for tomatoes to have separate cages or supports. My friend Darrel built this system out of leftover items he had laying around on his homestead, but you can use wood in place of the pipes. The idea is to have the support anchored, then reaching above the tomatoes. THEN, you loosely tie the tomatoes and pull the strings UP toward the support. Tying two plants together loosely first gives the plants more support for each other as well. The chain is there to be able to extend the string around the tomatoes easily without having to retie them. Once the tomato plant gets larger, then you simply pull the chain up higher to keep the plant supported. This also enables you to reach the fruit better, while keeping it off the ground. 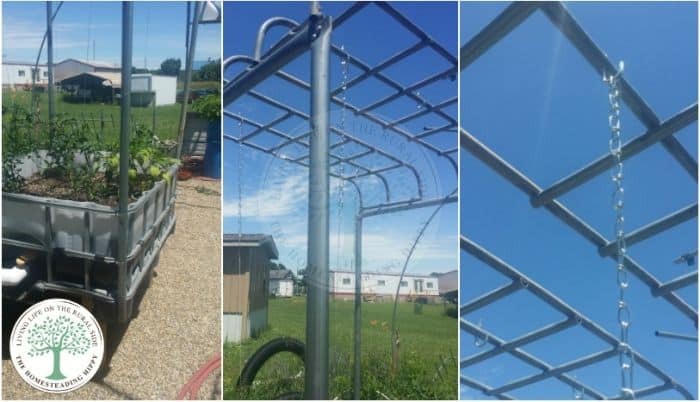 The top of the trellis is approximately 4 feet higher than the ground level, allowing the plants to reach their full height. A trellis is easy to build, really. 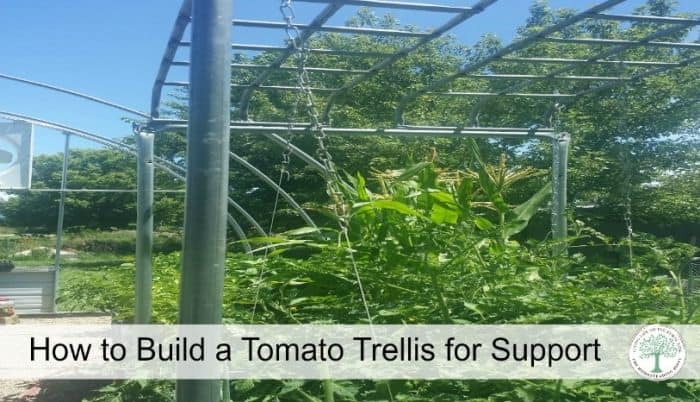 All it takes is something to support the trellis, and an upper part of the trellis. You can use reclaimed wood, old pvc pipes or do what Darrel did and use the parts of a garden bed support to make it. Tying the tomatoes up only requires some kitchen string. We have also used wool yarn, kite string and even thin twine from hay bales to do this. Use what you have on hand and get creative! 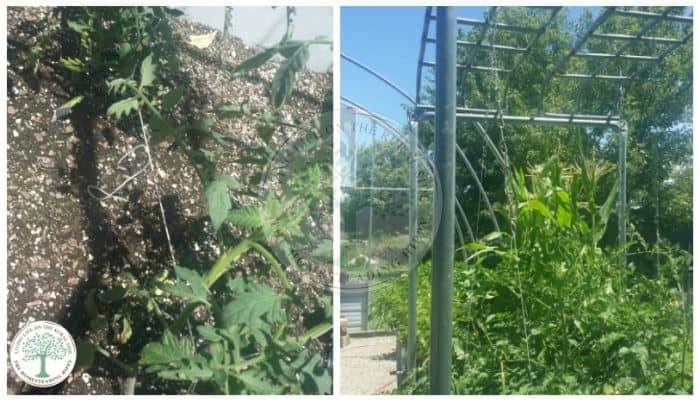 How to do you support your tomato plants? Do you like this trellis idea? Be sure to pin this for later!